You can schedule an appointment for your child with a family dentist in West County of St. Louis as soon as his or her first tooth begins to grow. Taking care of your child’s teeth and gums plays a crucial role in ensuring your child is off to a healthy start in life. If your child develops a dental disease that is left untreated, he or she can suffer serious oral health problems, including gum disease. Daily brushing, good nutrition, and regular dental visits can all help prevent dental disease and cavities. Children learn healthy dental habits from their parents and caregivers, so it’s important to be a positive role model and continue to schedule your own appointments with the dentist. At your child’s first appointment, your family dentist will learn about your child’s health history and conduct a complete oral exam. This allows your dentist to check the growth and development and detect any oral health issues. Your dentist will also clean your child’s teeth and provide suggestions for daily dental care. He or she can also tell you if your child is getting enough fluoride. 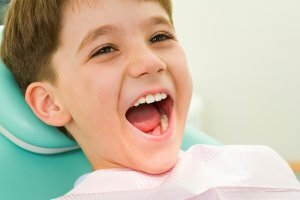 As soon as your child begins getting his or her baby teeth, it’s time to talk to your dentist in West County of St. Louis about proper care. These first teeth may not be permanent, but they help hold the space for adult teeth, so it’s still important to protect your child against tooth decay and gum disease. If your child does develop tooth decay, he or she may experience pain, difficulty chewing, and embarrassment talking or smiling. 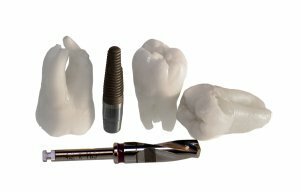 Unfortunately, tooth decay is incredibly common among children. The U.S. Department of Health and Human Services estimates around one in two children develop decay in their baby teeth. While consuming sugary foods and drinks increases a child’s risk of developing tooth decay, healthy habits like brushing and flossing can help prevent this common childhood disease. As a parent, you should start cleaning your child’s baby teeth with a cloth or soft children’s toothbrush as soon as they begin erupting. You should clean these baby teeth after feeding and right before bedtime. At age two, you can begin brushing your child’s teeth with fluoride toothpaste. You can start using fluoride toothpaste even earlier if your dentist recommends it. By age four or five, your child can start brushing his or her own teeth. However, you need to watch your child to ensure he or she actually brushes all of the teeth. For safety reasons, you should also make sure your child spits the toothpaste out, as swallowing too much fluoride can lead to white spots in adult teeth. Dentists recommend you continue watching your child brush his or her teeth until the age of seven or eight. 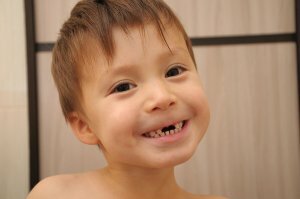 By age one, your child should have already had his or her first dental checkup. If your family dentist doesn’t take young patients, you can ask your pediatrician to recommend a dentist who is good with kids. Visiting the dentist can be scary for children, so you may want to sit in the chair first and ask the dentist if your child can sit on your lap during the checkup.